With hero #8 rolled out, today brought the opening of the doors offering a peak at hero #9. She will likely be rolled out for painting at some point this weekend, though that may be dependent on the forecast. Hero #9, the CCGS Captain Goddard M.S.M.,is named after Canadian Army soldier Captain Nichola Goddard, M.S.M, who has the distinction of being the first female Canadian combat soldier killed in combat, and the 16th Canadian soldier killed in Canadian operations in Afghanistan. 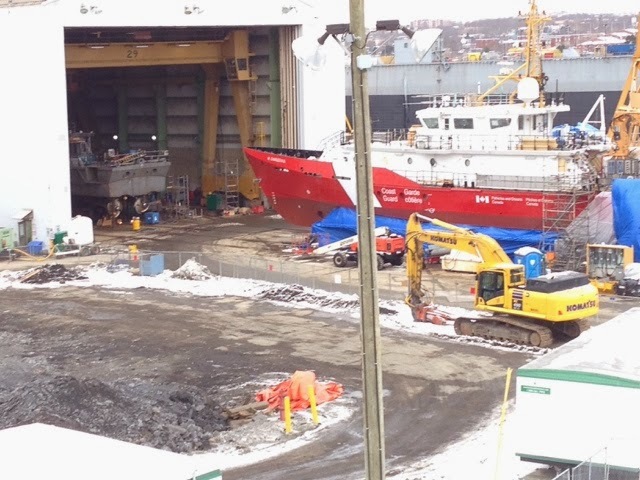 This entry was posted in CCGS, Halifax Shipyard, Hero Class, new build on February 13, 2014 by Peter Ziobrowski.